When I first moved from SPD to a road-based cleat system I was quickly won over by the Keo pedals after a lot of time experimenting with other systems. I had my dalliances with SDR-R (comfy but I found the little yellow bumpers wore out over time) and Speedplay and before I found my beloved Crank Brothers Quatro I landed on the Keo Max. The only thing that kept me from sticking with them is my role as a ride leader of a bike club in the ‘burbs. The pedals are made to stay engaged all day and I found the clipping-in and clipping-out at stoplights took a bit too much throw, even with the retention dialed down. The Keo 2 Max is quicker to clip into and out of, and they feel much stiffer than their predecessor, likely due to the larger contact surface with the pedals, 12-percent more than the Keo Carbon pedals. The pedals weigh 122 grams each in carbon and 130 in composite (ours were a tad heavier, but not enough to complain) and stood up to a beating and some inclement weather. Look rates them at a million cycles at 100 revolutions per minute with a 198lb load and eccentric (my type of) rotation. We weren’t lucky enough to get the snazzy Keo 2 white pedals (they weren’t available when the test started), which would have looked nice with the increasing number of white parts on my Calfee Dragonfly test frame. If you’re a fan of Look pedals already, the Keo 2 Max is a no-brainer. If you’re looking for your first road clipless, the Look Keo 2 Max is also a no-brainer. 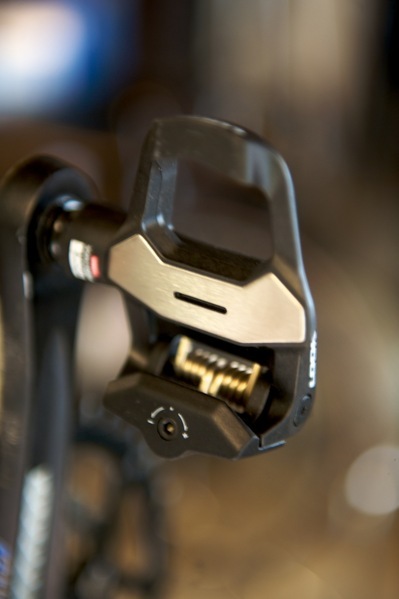 Durability, stiffness, comfort–there’s not a lot to dislike about these pedals. Carbons fetch about $249 a pair while the standard composite goes for around $179.